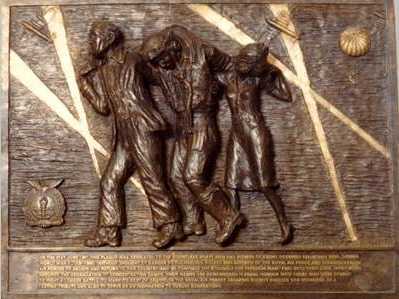 This plaque shows an airman being helped by a girl and an older man, as another airman parachutes down nearby. It was designed by Elizabeth Lucas-Harrison, who was later awarded the M.B.E. for her dedication and service as Secretary of the RAFES. ON THE 21ST JUNE 1981 THIS PLAQUE WAS DEDICATED TO THE COUNTLESS BRAVE MEN AND WOMEN OF ENEMY OCCUPIED COUNTRIES WHO, DURING WORLD WAR TWO (1939-45) WITHOUT THOUGHT OF DANGER TO THEMSELVES, HELPED 2803 AIRCREW OF THE ROYAL AIR FORCE AND COMMONWEALTH AIR FORCES TO ESCAPE AND RETURN TO THIS COUNTRY AND SO CONTINUE THE STRUGGLE FOR FREEDOM. MANY PAID WITH THEIR LIVES, MANY MORE ENDURED THE DEGRADATION OF CONCENTRATION CAMPS. THEIR NAMES ARE REMEMBERED IN EQUAL HONOUR WITH THOSE WHO WERE SPARED TO FIGHT A LONGER BATTLE. TO MARK ITS DEBT OF GRATITUDE THE ROYAL AIR FORCES ESCAPING SOCIETY ERECTED THIS MEMORIAL AS A LASTING TRIBUTE AND ALSO TO SERVE AS AN INSPIRATION TO FUTURE GENERATIONS.